I am very confident that we saw a wolf last week. We were travelling westbound on highway 7/8 between New Hamburg and Kitchener. At the side of the road just coming out of the brush in a wooded area was the wolf. My husband and I both saw the animal and he sat there seeming to be deciding to cross the road. At the point the highway is 4 lanes, so I hope the Wolf stayed put. He was a beautiful grey. 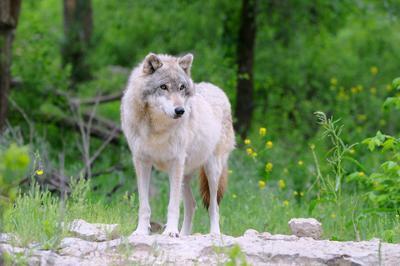 Thank you for your contribution, Kelly, I found this picture of a Gray Wolf for our readers to see. We hear the cries of Coyotes almost every night in Foxboro Green, very close to where you spotted the Wolf. They would be natural predators.